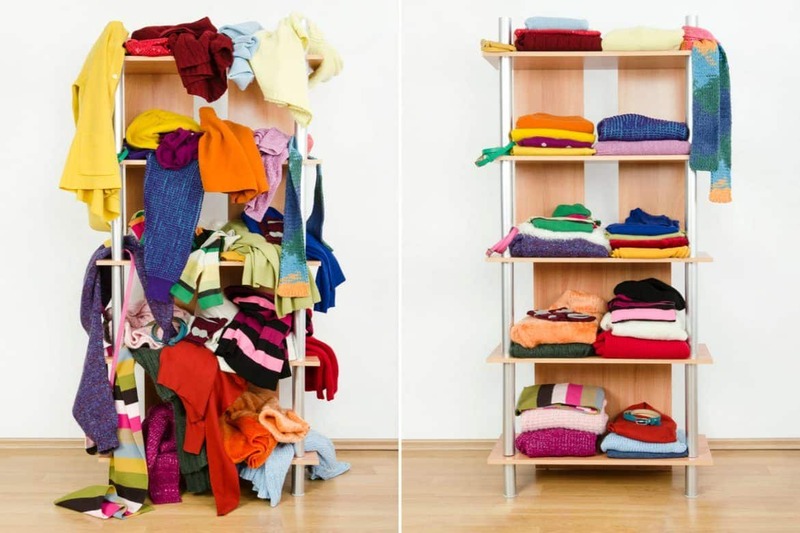 If you feel like you just can’t get a handle on the clutter in your home, you may be making some common organizing mistakes. Don’t worry though, these are all fixable mistakes and you’ll have your home decluttered in no time! If you struggle with keeping your house organized and feel overwhelmed by the mess, be sure to check out these mistakes below and see if they apply to you. Your organization system is too pretty, but not functional. We all fall victim to this, especially if you are constantly on Pinterest looking at organizing ideas. The ideas look so pretty, but when you go to implement them in your home they are total Pinterest fails. Does this sound familiar? I know it does for me. The problem with these systems is sure they are great to look at, but many lack function. It looks very visually appealing to have rows of cute baskets lining your shelves, but if you can’t see the items that go inside or there is no labeling system, you might as well have not even bothered! What you should do instead is implement a system that works for you and don’t kill me here, but it doesn’t have to be pretty. Maybe you are someone who needs open shelving in order to see everything and having everything all tucked away neatly doesn’t work for you. Just give yourself permission to have a few “ugly” organizing areas of your house. We all don’t have to be perfect and feel like our houses have to look like Better Homes and Gardens…right? Your items don’t have a proper home that makes sense. Every single thing in your house needs to have a proper home that makes sense to you, as well as other that share the space. Don’t keep scissors in your bedroom dresser or store clothing in your family room. These possessions should be stored in a room that makes sense to what they’re used for. If your clothing is stored in all different rooms of the house, it may be time to pare down. You’re not maintaining your organizing system. So here it is, you spent hours trying to organize every room of your house. It looks great and is very functional, but a week later it is a disorganized mess again! If any organization system is going succeed it needs some maintenance and love. Try to put everything back where it belongs as you go. If this can’t happen for whatever reason, spend five to ten minutes a day just putting your items back in their proper place. This is going help you not have a huge mess at the end of the week! You’re not purging your items regularly. As the seasons change, take time to reevaluate what you really need and use. If you haven’t worn a particular piece of clothing in years, maybe it’s time to donate it. Maybe you don’t need twenty coffee mugs and can part with a few. There’s one little sentence you need to ask yourself when evaluating whether you should get rid of an item. My favorite professional organizer Marie Kondo has this whole philosophy behind organizing. It’s really quite simple…if it doesn’t spark joy, get rid of it. Surround yourself with items that spark joy. Easy right? We all tend to overcomplicate everything, me included. But it’s really that simple. Ask yourself if the item sparks joy for you and if not, you know what to do! You’re not enlisting help from others and feel overwhelmed. I’m willing to guess many of you may live with someone else (kids, family members, significant others, etc.) and many of the spaces you organize are common areas of the house. When you feel like you can’t keep up with the mess, just ask for help. Hopefully, you’ll get some extra help and the other person can put away items from time to time. Hope you enjoyed this post and now find organizing a little less daunting! Comment below and let me know what you think or share your favorite organizing tips!